Dr. Weeks’ Comment: For the past decade, I (and other doctors offering Corrective Cancer Care™) have been a vocal critic of conventional cancer treatment which targets the cancer TUMOR cell while stimulating the really dangerous cancer cell which is the cancer STEM cell. If this is new to you, review these articles HERE and HERE and watch this video. Take home message “Chemotherapy and radiation therapy make your cancer worse.” Prof. Max Wicha M.D. – so target your cancer STEM cells. Researchers at The University of Texas at Dallas have devised a new technique to isolate aggressive cells thought to form the root of many hard-to-treat metastasized cancers—a significant step toward developing new drugs that might target these cells. “Our lab is interested in finding ways to prevent cancer recurrence,” said Dr. Jiyong Lee, assistant professor in the Department of Chemistry and Biochemistry in the School of Natural Sciences and Mathematics at UT Dallas. “The problem is, not all cancer cells are equal. Lee and his colleagues used a two-step process to sort through a library of 40,000 chemical compounds, looking for any that would selectively bind to breast cancer stem cells, isolating them from standard breast cancer cells. The screening process identified five compounds, called ligands, that bind specifically to cancer stem cells, and the researchers selected one of them for closer study. The results were published online recently in Chemistry—A European Journal. 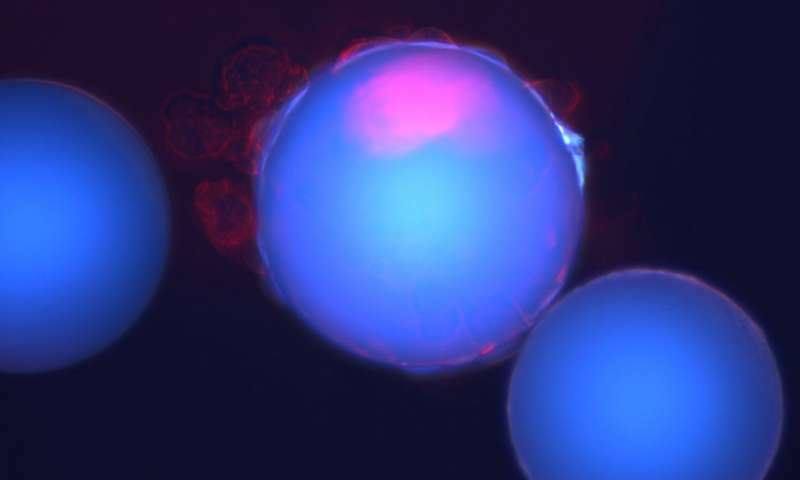 While similar methods have been used to separate cancer cells from normal healthy cells, Lee said the results mark the first demonstration of a technique that separates cancer stem cells from other cancer cells. Similarly, cancer stem cells—believed to reside at the heart of tumors, fueling their growth—are also thought to be unspecialized and able to self-renew until they transform into new cancer cells. Most effective treatments for primary tumors leave cancer stem cells unscathed. Even if a primary tumor is successfully treated, cancer stem cells can travel unnoticed by the immune system through the bloodstream to seed new tumors elsewhere, a process called metastasis. Many researchers, including Lee, believe killing cancer stem cells in a primary tumor should eliminate it by removing its renewable source of cancer cells, while also preventing the genesis of new cancers. There are currently no clinically proven drugs directed at cancer stem cells, he said. Using available data on physical factors that differentiate cancer stem cells, Lee’s group incubated a mixture of both breast cancer stem cells and non-stem cancer cells together with 40,000 tiny plastic beads, each coated with multiple copies of one ligand. After two screenings, Lee identified a particular ligand that he believed bound to only the cancer stem cells and used it to separate them from non-stem cancer cells. To confirm this, he injected each set of cells into mice and monitored the animals for tumor growth. “In the cancer stem cell group, we got rapid tumor growth and bigger tumor size than we saw in the regular cancer cell group,” Lee said. “We also saw even more cancer stem cell activity, which helps explain why these tumors were more aggressive. Lee envisions the ligands he identified being used in multiple ways, including therapeutics, diagnostics and imaging. “The simplest version of a therapeutic would be attaching a toxic agent to the ligand, which would then bind selectively to and kill cancer stem cells,” Lee said. “It would also be beneficial to adapt these ligands into imaging agents, which would light up the cancer stem cells in a patient and help determine the best treatment options.